Moments ago former two-division world champion Joan Guzman 29-0-1 (17KO’s) faxed his signed contract to make official his rematch with two-time world title challenger Ali Funeka 30-2-3 (25KO’s) for the vacant IBF lightweight title. The bout will take place March 27th at the Foxwoods Casino in Connecticut, Miami and the Madison Square Garden in New York are being considered as sites for the fight. HBO will televise. When Guzman and Funeka first met this past November many observers felt that Funeka deserved the victory instead of the official result of a draw. 116-112, 114-114, 114-114. Team Guzman countered that the fight was close and that a case could be made for the draw. “I’m thankful to HBO, my promoter Golden Boy, and my manager Jose Nunez for this opportunity. 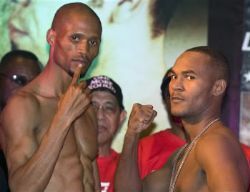 I’ll be very prepared and ready come March 27th.” Guzman will enter the bout with a new trainer in Lee Beard. Beard formerly trained former world champion Ricky Hatton.